and rivet a tear into my cheekbones. 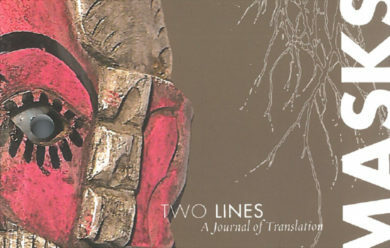 Two Lines, Issue 13: Masks features eighteen different interpretations of masks across continents, languages, and time periods. It includes an excerpt of Jorge Volpi’s novel spoofing fads in French philosophy, a traditional Alaskan native tale retold by John E. Smelcer, and Murathan Mungan’s short story about sexual identity. The issue also includes poetry from Dahlia Ravikovitch, Cai Qijiao, Paul Morand, César Vallejo, and Marcelijus Martinaitis, among others.